Could Navas to Real Madrid pave the way for Casillas to Arsenal? 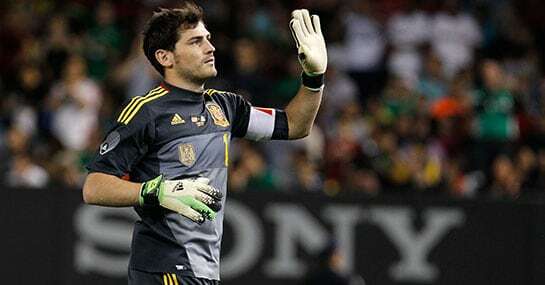 Betting News > Football > Premier League > Could Navas to Real Madrid pave the way for Casillas to Arsenal? Real Madrid have reached an agreement with Levante over a deal to bring Costa Rica international goalkeeper Keylor Navas to the Bernabeu, according to Spanish newspaper AS. The 27-year-old, who will cost £7m, will become Los Blancos’ third summer signing joining Toni Kroos and James Rodriguez at the European champions. Navas joins Diego Lopez and Iker Casillas on the goalkeeping books in Madrid but could the World Cup star’s arrival spell the end of the road for one of Real’s two senior keepers? Speculation is mounting regarding Casillas’ future with reports linking him with a free transfer to Arsenal constantly cropping up. The Gunners have been close to adding to their own goalkeeper ranks with a move for Colombian stopper David Ospina but with no official confirmation from the club, there is still time for a late change of heart from Arsene Wenger over a move for Casillas. The Spanish international faces the prospect of being third choice keeper at the Bernabeu behind Lopez and Navas should he stay at the club but it seems as if he has made the difficult decision to call time on his long association with Real Madrid. And with Casillas angling for Real Madrid to let him leave on a free transfer it could prove to be a deal too good to be true with Wenger. The 33-year-old, who has made 478 appearances for Los Merengues, would add vital experience to an Arsenal squad, who are 13/2 to win the Premier League, looking to mount a title challenge. With a reported £100,000-a-week, five-year deal on the table from the Gunners, Casillas would provide excellent competition for current Arsenal number one Wojciech Szczęsny as they look to build on last season’s FA Cup win. Arsenal have already strengthened their squad by splashing £42m on Alexis Sanchez and Mathieu Debuchy, while Wenger remains in the hunt for a defensive midfield option and a possible replacement for Thomas Vermaelen. Who should Arsenal sign as competition to Wojciech Szczęsny? Tweet @OliverYew with your views.